Relationship is the first and foremost ingredient in building a strong parental authority. Authority flows from relationship. The knowledge that we love our children no matter what they do or say gives us a legitimate authority in their eyes. A strong loving relationship with our children gives our authority credibility. Build your relationships with your children and you strengthen your authority in their lives as well. Next, add a healthy dose of empathy and compassion to create a strong and healthy parental authority. When we love our children, we hurt when they hurt. We want to relieve their suffering and ease their struggle. At times, we will relive their suffering; at other times we will let them suffer the consequences of their actions because we love them. Even then we will empathize with their disappointments and discomfort. They will recognize our empathy, even if they never admit it to us. I have heard many people note that the worst part of being disciplined by a loving parent is seeing the hurt in their parent’s eyes. Our compassion and empathy for our children adds weight to our authority in their eyes. Parental authority also demands a generous dose of longsuffering. We do not use the term “longsuffering” very much today. However, longsuffering, in combination with compassion, is an important ingredient in parental authority. We hate to see our children suffer, even when that suffering results from their own choices and actions. We suffer long when we lovingly allow our children to experience the consequences of their choices and actions. But, that “longsuffering” pays great dividends over time. When we allow longsuffering to temper our compassion, we will witness our children maturing through the consequences of their actions and choices. The ability to not jump in to rescue our children, but to “suffer long” instead, strengthens our authority as wise and sacrificial parents. Brevity and an economy of words will add oomph to our parental authority as well. Yelling, lecturing, and nagging will minimize our authority. If our children learn we will say something over and over (lecturing, nagging), they quit listening. If they know we are not going to follow through until we yell, they will wait for us to yell before taking action. In other words, our children learn our words have no weight and carry no power when we yell, lecture, or nag. When we simply state an expectation without lecturing, nagging, or yelling, our words become authoritative. When we follow our words with simple consequences, our children learn we have authority, our words have meaning. And, they learn to listen. They learn to respect authority. A similar ingredient in parental authority is silence. Yes; silence is powerful. Silence allows our children time to think and process what was requested or expected. As our children think and process, they internalize the values and expectations we are teaching them in silence. Give them space to think. The final, but not the least, ingredient in parental authority is consistency. A parent with a strong authoritative presence will consistently relate to their children with compassion and longsuffering, making requests and stating expectation with an economy of words. Sure, we will make mistakes; but consistent effort will strengthen a healthy, loving authority our relationship with our children. 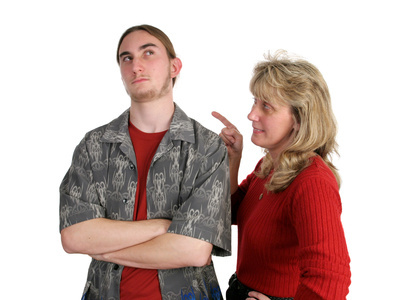 A healthy parental authority does not come easy. It flows from relationship and is strengthened by consistent compassion and longsuffering. Practice it wisely and you and your children will find great benefits.